There’s no doubt when considering a vacation to Europe, Athens, Greece is a popular destination. From the ruins to the food to the fabulous weather, it offers a lot of everything. Sometimes, however, it might offer just a bit too much. You can go to a historical site every day for two weeks and still not see everything. And that’s just in Athens. Seriously, how many bone sewing needles and marble pillars from 200 B.C. can you look at before it becomes tedious? As the child of a Greek mother and American father, who live in Athens part of the year, I’ve spent a lot of time in Greece. Particularly in Athens, because quite simply, I love it. It’s a beautiful, interesting and lively city with hidden treasures everywhere–the kind that have nothing to do with 2500-year-old ruins or feta cheese. Not that there’s anything wrong with either of those–I’ve been to the Acropolis at least six times and will undoubtedly go at least a few more. However, there is only so much you need to do to really make the most of your time and money. So I’ve compiled what I consider the best of the best, from a tourist who’s also something of a native. The five places you absolutely need to see if you visit Athens. These places are not only memorable, they capture the essence of Greece (its history as well as its present). Although this is not a comprehensive list, these are the places I go to over and over, regardless of how many times I’ve been to Greece, and places that bring maximum appreciation of all that encompasses one of my favorite cities in the world: Athens. 1. The Acropolis/Acropolis Museum. This is not just a historical landmark; this is architecture, history, passion and art, all put together for a tidy package of awesomeness. There are probably a hundred adjectives that could describe the experience of climbing up to The Acropolis and looking down upon the city, but none of them do it justice. It’s also on the UNESCO World Heritage List. The site is falling apart, destroyed by war, looting, weather and other disasters, and yet it stands proud. More than two thousand years old–and this is after it was rebuilt because the original was burned by the Persians–nothing else in the world is really quite as awe-inspiring as this monument. Despite missing pieces, scaffolding to hold up parts of all the remaining structures, and new construction to replace pieces that have now been moved to the museum, it remains an epic piece of the history of civilization. No matter how many times you go, it’s worth every penny of the 12 Euro admission price. Going in the early evening (it stays open late during the summer) is a good option because the heat can be prohibitive during the day. Just down the street is the Acropolis Museum. This museum didn’t exist when I first started going to Greece as a child, so when I visited in 2012 with my husband, I was happy to check out something new. Not only is it my favorite museum in Athens now, I’ve since been back and there are even more wonderful items than the last time. The first thing you notice is that while building the museum, they discovered yet more relics, so the floor of the entrance way into the museum is glass that allows you to look at the excavation going on underground. It’s both disconcerting and extraordinary to see another part of the city that existed around the time of The Acropolis being dug out one piece at a time. Inside, many of the original pieces of the Acropolis have been taken from the site and brought to the museum for safekeeping. 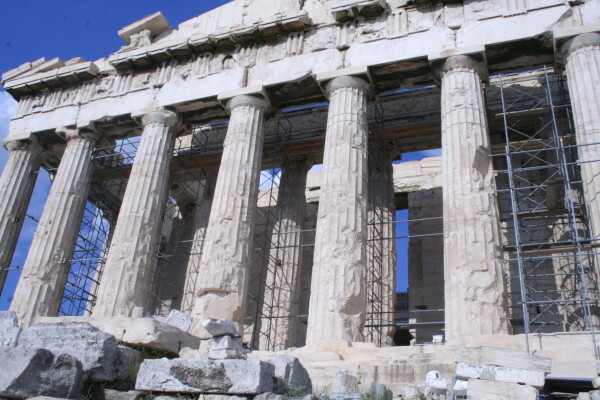 You absolutely cannot miss the top floor, where original pieces of the frieze, pediment and metopes from the Parthenon have been reconstructed in real size. Although many pieces are either gone or not yet moved from the original site, being that close to such incredible beauty, history and talent is inspirational. The pieces are close enough to touch (although you will be scolded if you do) and there are drawings, historical data and photographs from other eras to show you exactly what it is, what it’s been through and what they think it either was or was going to be. That’s not to say the rest of the museum is boring. There are statues upon statues, with all sorts of relics from jewelry to pottery, statues to weapons, and artwork beyond your wildest dreams. Seeing what people were capable of creating in a time without any sort of technology is truly one of the most educational things you’ll ever experience. Again, worth every penny of the 7 Euro admission price. 2. Mt. Lycabettus. This is the highest point in Athens. I highly recommend going just before the sun sets, because not only is it cooler, it’s also the most beautiful time of day. You can have a taxi take you part of the way up, and then walk the rest of the way, or you can take a tram-like vehicle called a “Funicular” that costs 7 euros per person round trip. The tram isn’t scenic, but it’s quicker and a bit safer. The steps are somewhat slippery from years of visitors wearing down the marble and rock. Sneakers or tennis shoes are a must if you’re walking. View of Athens from Mt. Lycabettus at dusk. At the top, you are greeted with the most amazing view of the city you’ll ever see, St. George’s church, and a lovely restaurant where you can either have a quick drink or a full meal. 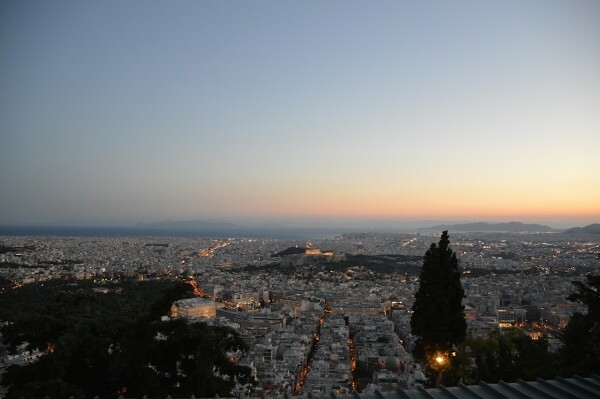 The view is simply breathtaking, especially at sunset, and if you stay at the restaurant as night falls, you’ll watch lights come on across the city, with The Acropolis as the highlight. The food is actually quite good, as is the service, but prices are a little higher than your typical cafe. Two people with an appetizer, two glasses of wine, and two entrees can cost upwards of 70 Euros. Not to be repetitive, but still worth every penny. 3. Syntagma Square/Parliament House. This is one of the most lively and fun areas of the city. Some of the best hotels in the city (the Hotel Grand Bretagne and the King George are among them) sit right on Syntagma Square. At the top of the Square, directly across the street, is Parliament House where the hourly changing of the guards is not to be missed. 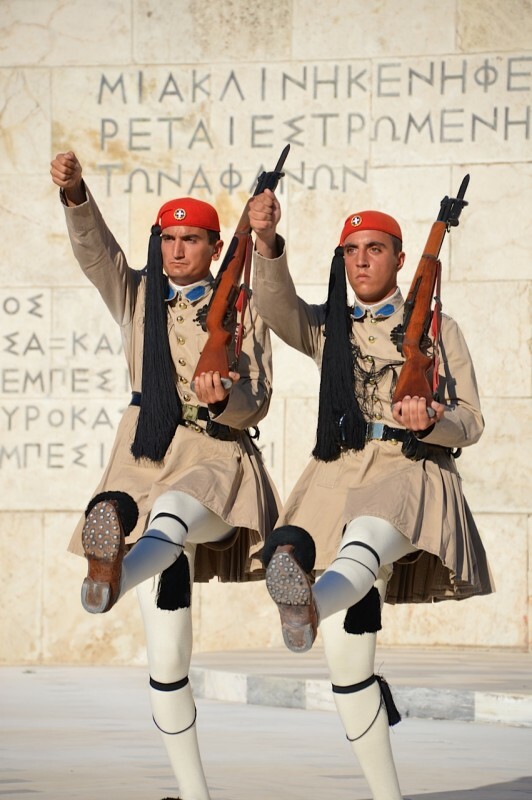 Wearing the traditional skirts (“fustanella”) and stockings, the guards perform the ceremony year-round, and feeding the pigeons while you watch will undoubtedly delight young and old alike. Monasteraki is really an entity of its own, but once you’ve walked around Syntagma Square, the path ultimately leads you down a few blocks and there it is. Essentially a formal, permanent flea market, many of the shops have been there for thirty years. You’ll find everything from a replica Trojan helmet to t-shirts, postcards, real leather shoes and handbags, jewelry and much more. Those who love to shop can spend an entire day exploring. One of my favorite stores, “Roka,” is owned by Rita, who makes traditional wood paintings, table cloths and coasters, and has been there for longer than she can remember. She’ll share a bowl of fruit with you, sign any artwork you buy, take pictures and hang out. The area is full of tourists, but you’ll also get a feel for the Greeks who live and work there. 4. 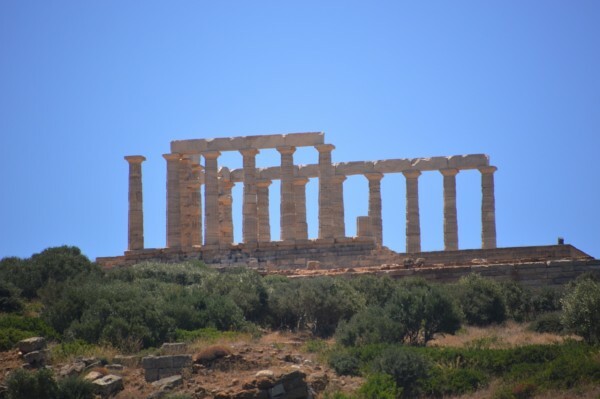 Sounion/Temple of Poseidon. Technically, this is 45 miles outside of Athens, but it’s the most worthwhile side trip you’ll take, whether you book a tour, take a taxi or rent a car. Driving along the Mediterrannean Sea is an experience in itself, just winding through the mountains and looking at the glorious colors and glass-like appearance. It’s simply stunning, and frankly, pulling off to take some pictures and stare at the view is enjoyment in itself. However, if you make the rest of the trip to Sounion and the Temple of Poseidon, you’re in for an even greater experience. The temple itself is in better shape than many and the history that goes with the myth is fun, even if mythology isn’t your thing. It costs 4 Euros to get in and once you’ve wandered up to the temple and taken your pictures, it only takes a few seconds to realize you’re looking down at some of the most glorious beach area in the world. If you’re not on a guided tour, you should get back in your vehicle and go down to that beach, located at the Aegion Beach Hotel. There’s free parking and for 10 Euros you can rent two loungers and an umbrella and spend the rest of the day laying on the ultimate beach, with access to the restrooms, wifi, an incredible restaurant just a few steps from the sand, and of course, the Temple of Poseidon and stunning cliffs surrounding it all in your line of sight. There is no better way to spend the day in Greece. 5. Glyfada. It’s a little pricey and a little pretentious to the Greeks, but for less than 10 Euros by taxi (depending on your starting place) or around 0.70 Euros on the tram line, this suburb is about 15 minutes south of Athens and offers a little bit of absolutely everything. On one side, walk a few hundred yards right onto one of many beaches, or go the other way for everything from high-end shopping to gourmet ice cream, the world’s best meatballs or even a Dunkin’ Donuts. There are high-rise condominiums right next to gorgeous, beach-side hotels, store windows filled with Prada and Jimmy Choo, and restaurants galore. There’s a newer restaurant called Tsi Tsi that had quality food for a good price, and if you walk back towards the water on the same street, you’ll find dessert and coffee shops galore. Are there really only five places you need to see in Athens? Of course not. But after having visited most of the big name tourist attractions, these are the ones you shouldn’t miss. These are the sights, sounds, tastes and smells that will stay with you forever. There are dozens of beautiful monuments, museums, restaurants and places that aren’t mentioned above, but there truly aren’t any that are better. Northern Greece and the islands hold an entirely separate charm, but for Athens, this list comes pretty close to perfection. Wow!! That was a terrific article! 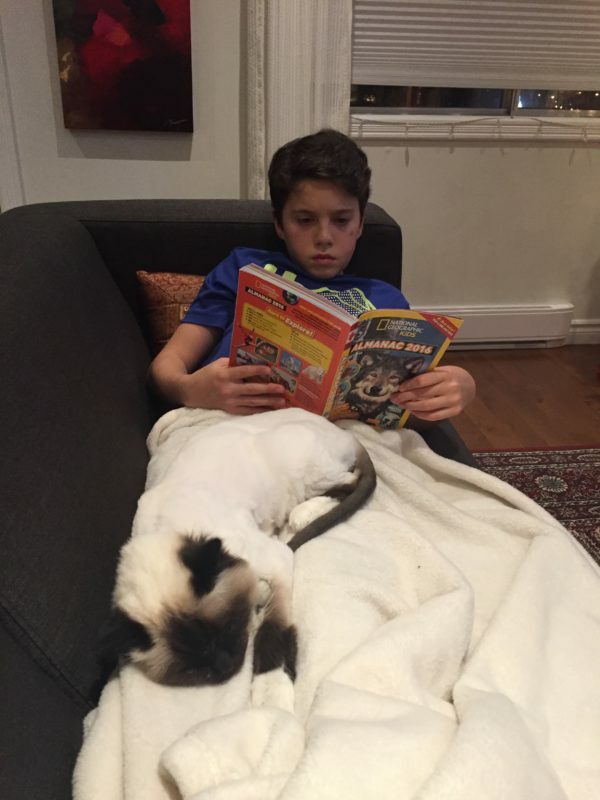 So helpful and very fun to read! I wanna go! When do we leave? Thanks a lot for the great infos. Very helpful and interesting. Great pictures also !!!! Awesome article. Greece is next on my bucket list, so I’m always excited to read about it… this article has me soooo pumped! I want to go right NOW! Great article! I have never been, but hope to visit one day. Great article! Planning a 2 week trip to Europe and now I can abbreviate my stay in Athens! That means I can see more countries! Thank you so much, Kathy! 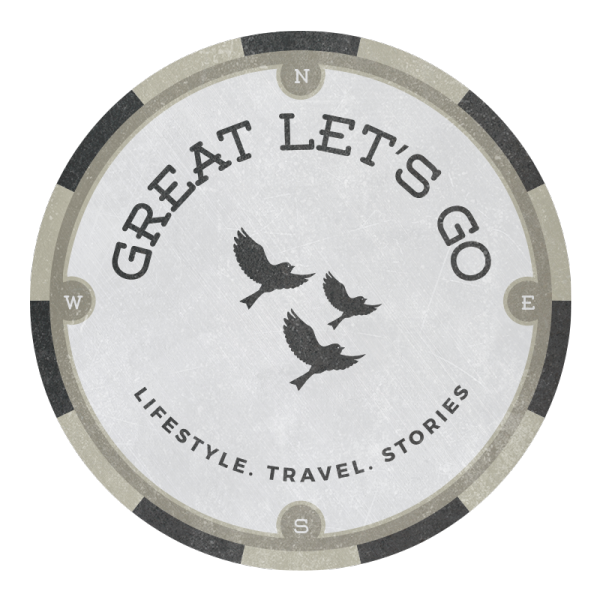 Great article… Greece is my next vacation!! Thank you, everyone. I’ll be writing about Camogli, Italy next. Great article…very thorough and it’s always helpful to hear a real insiders view. I have always wanted to go to Greece and especially Athens. I’ll get there someday and this is very helpful to someone who has never been. Well written and easy to read article. Makes me want to book my trip today !! Thank you, Kathy for all the inside info on Athens. I have never been, though always wanted to go, and your article and photos really tempted me to make the trip! Ps. Great that you also added all the different prices.. very useful.